Nobody has reinvented the wheel here, while some claim to have unique blended natural products some others claim to have a magic treatment added to sodium chloride. Basically it is all the same stuff in a different blend in a new bag. Given this, blends are more difficult to price compare since you have to consider percentages of each ingredient. Consider that the more salt the less expensive the blend will be, the more calcium and magnesium included in the blend the more expensive it will be. Be wary of breakthrough performance claims. In fact many of the medium expensive blends offer little performance advantages over regular salt. There are some things to watch out for: the harmfulness of the product to vegetation, harmfulness of the product to concrete, how much the product stains carpets and floors when tracked indoors, and how cold it can be for the product to work effectively. The trade-off of course is price, but as with anything worth buying, you will tend to get what you pay for. Scroll further down the page for more information and tips. The most economical ice melter for maintaining walks, entrances and other traffic areas. Irregular shaped crystals also provide traction. Use 8-10 oz. per sq. yd. A high quality blended ice melting product. A combination of calcium, potassium, sodium chloride and urea form a highly effective and environmentally friendly blended product. Leaves less residue on carpets than rock salt. Use 6-8 oz. per sq. yd. The most powerful and effective ice melter available. Safest for concrete and will not leave a visible white residue if tracked indoors. 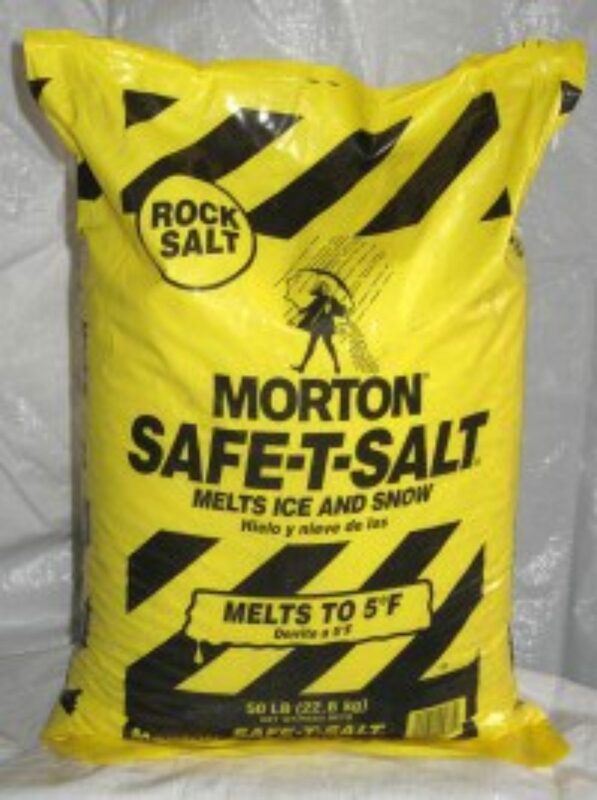 There is more volume per bag than salt because it is relatively light weight. It is friendly to vegetation and provides excellent melting performance to –30F. 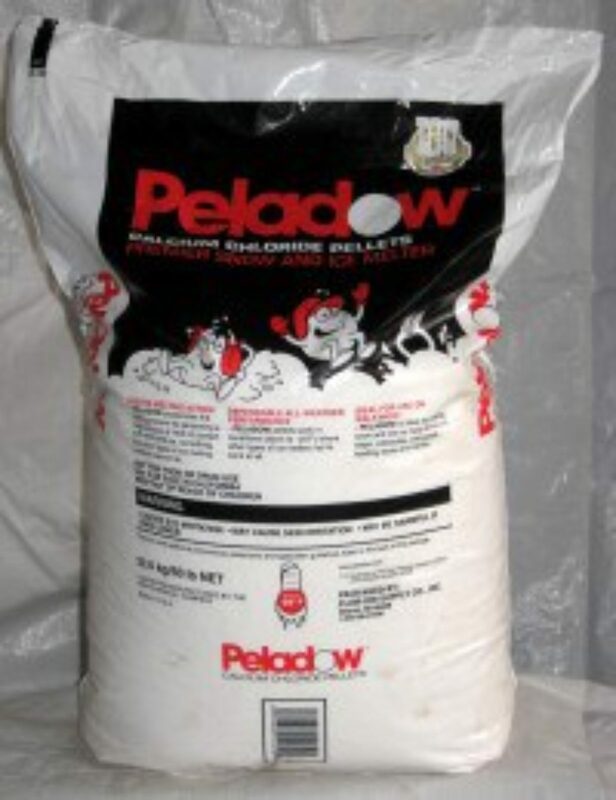 The Peladow pellets neatly undercut and disband ice from surfaces. Not much product needed for good results. Use 2-4 oz. per sq. yd. Bulk salt is available for loading Mon. - Fri. between the hours of 8 am - 5 pm. You may purchase any quantity. Buying in bulk is a good option for direct loading in large spreaders. The above ingredients are sometimes sold straight or are often blended. Cheaper blends will have higher salt (sodium chloride) content. Some blends use a treated salt or “accelerator” which is often composed of magnesium chloride. These accelerants are typically coatings for the salt crystal which may slightly improve the ice melting performance. Be cautious of product claims where the price is somewhat comparable to rock salt yet it’s performance is “fantastic”. It is more likely salt in disguise. There are no magic ingredients in the ice melt world, just different combinations of the above components. How much needs to be spread for each application? How harmful is it to vegetation? How well does it go through your spreader? Does it work at low temperatures? Does handling it affect your skin? Large areas such as parking lots typically require salting, other areas such as walks or entryways, consider your priorities. Most common considerations are, price per application, effectiveness, potential cement or plant damage, tracking, and ease of spreading. 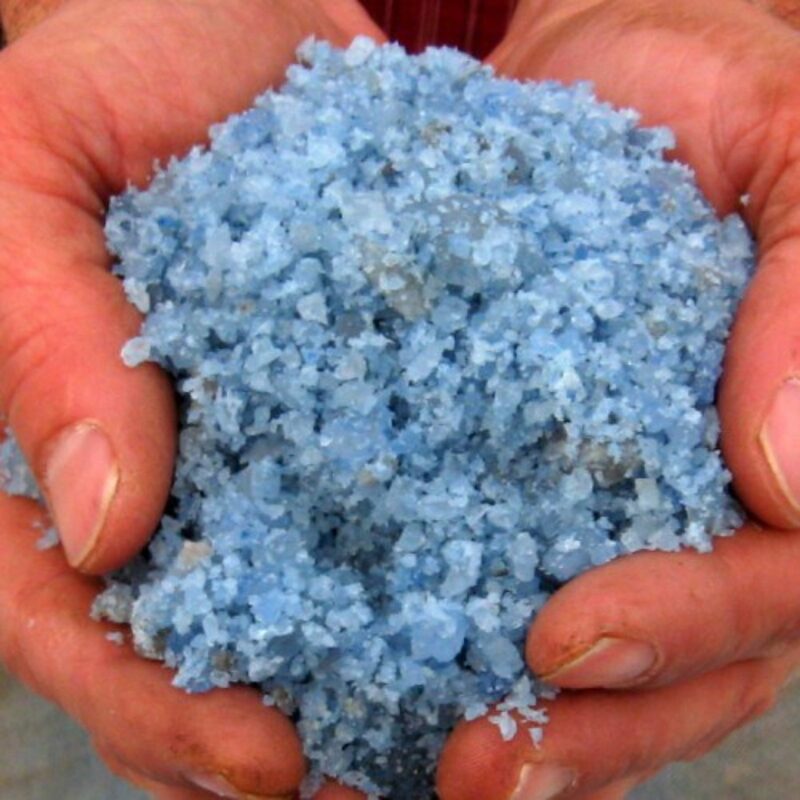 The lowest cost per pound is rock salt. The next lowest cost are treated salt and a high salt content blends. Again, be cautious of the additional benefits gained with the use of a low to medium priced blend which includes very small percentages of calcium or potassium as a blended additive. 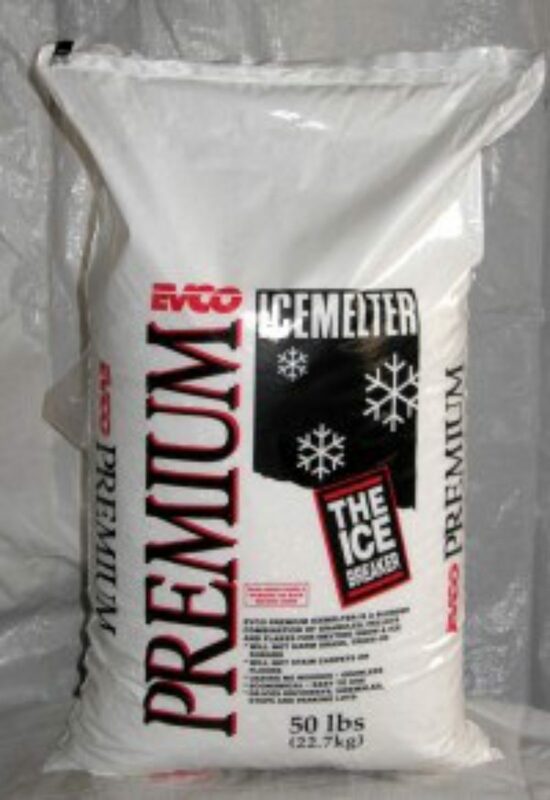 Our Evco Premium Ice Melter is a blend with a good amount of calcium, some potassium, a little magnesium and some salt. It is a great mix for a mid to mid-high priced product. This type of blend spreads nice, and offers a good balance of desirable characteristics. Arguably the best product is calcium chloride pellets. It melts fast, it tracks very little and is friendly to plants. It also takes very little to be effective, so its price per square foot is actually very reasonable. Also it is lighter than salt so you get more per bag. The only notable drawback is it may dry your skin out if you come in contact with it. Use a scoop or spreader, and gloves (not leather) to be safe. The key to controlling cost and minimizing the negative effects of using ice melt products is using the right amount of product. The tendency is to use too much each time. 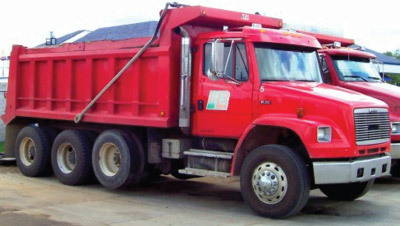 KLS owns a fleet of loaders, trucks and specialty snowplow equipment for any size job. Special attention to detail, competitive pricing honesty and integrity all add up to a high value service. 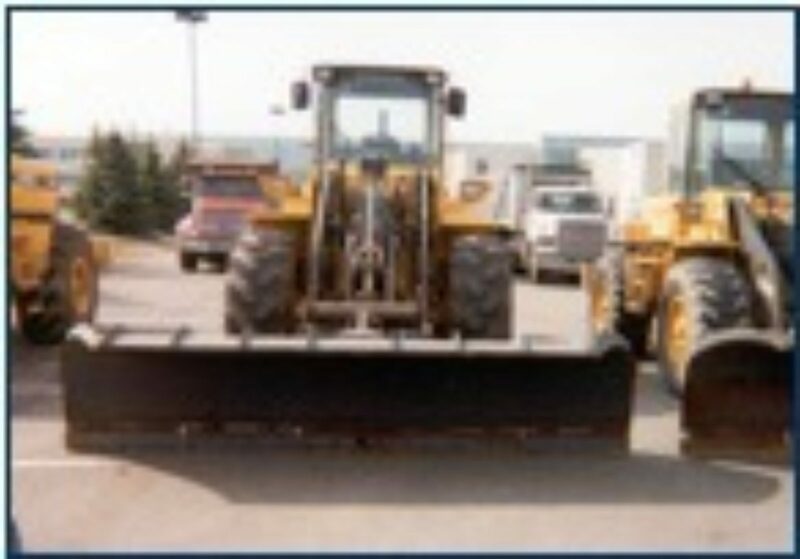 Special in front end loader and snow trucking services. Removing accumulated snow piles on confined sites is our specialty. Experienced operators will efficiently use front end loaders and right-sized trucks to move snow onsite or to remove from your site. 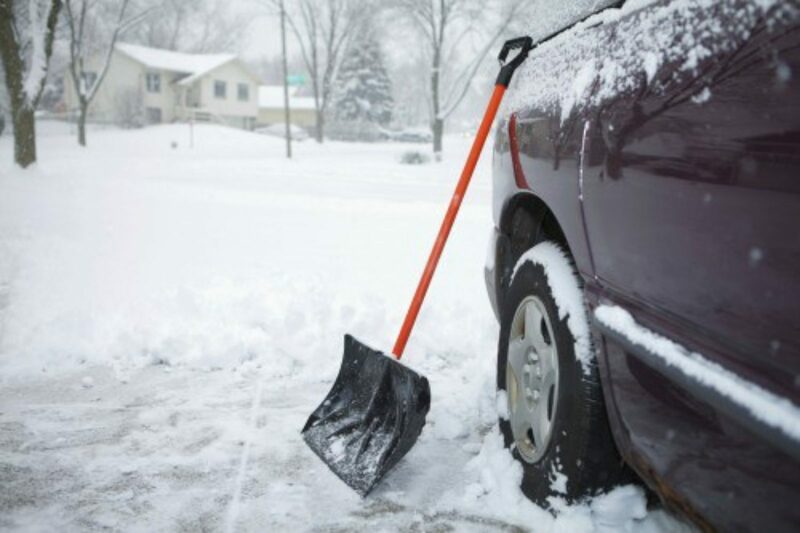 One time lot and road salting services are also available.